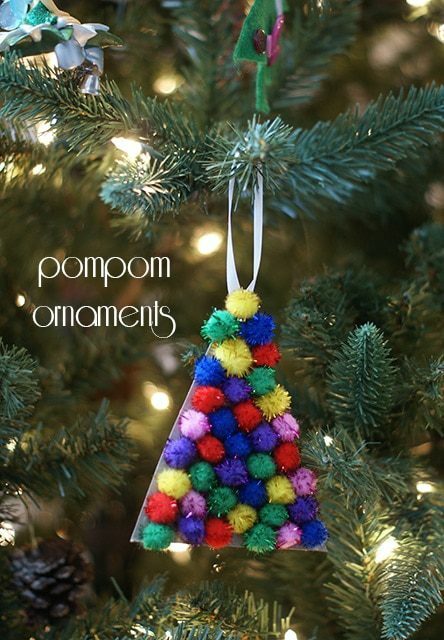 After the success of our pony bead candy canes, I’ve been reminding myself that simple crafts really are the most fun for my girls, and these pompom ornaments definitely fit the bill. Use cardboard from cereal boxes or other food packages as the base for these, add a little glue and some fuzzy pompom balls, and you’re set! Older kids can cut their own shapes, while little ones might need a little help with the glue, but either way it’s a simple but fun project that results in a cute ornament to hang on the tree or give to the grandparents! Cut out the shape of your choice from cardboard. You could do a triangle tree, a star, a circle (like a ball ornament), a candy cane or a gingerbread man. Trace a cookie cutter for some of the harder designs! Loop the ribbon and glue it in place at the top. Glue a pompom on top of the ribbon and continue adding them until the whole shape is covered. Set flat to dry completely before hanging on the tree.